As the effects of winter start to thaw, it is no surprise when you see anglers getting their gear ready for the upcoming fishing seasons. In the area that my family and I reside in, trout fishing, in the streams is ever growing in popularity. Preparing gear for all four of us can be exhausting at times, but also rewarding when the final outcome yields great results. When fishing in a stream, often times we will climb right on into the water. This allows us to fish those pockets you just can’t reach from the shoreline. I might also add, that most places we like to fish, will often require a hike through the woods. As you can guess, carrying all that gear through the trails can get frustrating at times. Which is why our waders are often left behind. You are safe to assume that we go through a ton of shoes, as after wearing them in the water, our shoes tend to be ruined. Now you might be asking yourself, is there a solution for this? Your answer to this question is yes, there is a solution to ruining your shoes. As I stated earlier, we often find ourselves traveling over terrain that limits the amount of gear we can carry. Which makes hauling our full waders nearly impossible at times. That is the reason many anglers will wear or pack wading boots. Wading boot designs and features have changed drastically over the years. 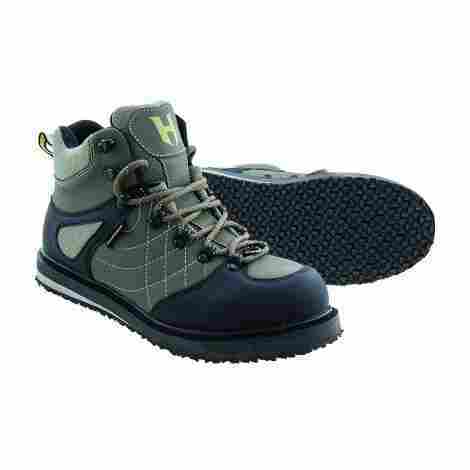 This is due to the materials available in current times, making the quality of wading boots better. The theory behind wading boots is simple, add a pair to your regular fishing gear. Doing this will add a high level of safety to your fishing experience, as well as saving you some money in purchasing new shoes after your fishing trip. Now we have come to the part of this guide where you will need to choose a pair of wading boots. There are many factors that will sway your decision in choosing a pair of boots. Here you will find that we have created a list of what we feel are the best wading boots available to you. We have given you a quick review of each of the boots on our list, this is meant to give you the opportunity to make an informed decision for yourself. The first pair of boots on the list will keep you upright, no matter how difficult the water bottom is. Not to mention, you will never know that you have them on. They offer your feet a large amount of comfort. You can be sure that the grip these wading boots has to offer will keep you on your feet. Mossy log, no problem with these boots. The sole is made from rubber, with a specialized grip, to keep you from slipping with every step you take. Your feet will thank you for choosing these boots. These wading boots have extra padding in all the areas that typically cause discomfort. The insole also has added padding, making sore feet a thing of the past. Providing your feet with both comfort and grip, these boots are a valuable addition to your fishing gear. Although they may seem to be higher in cost, what you gain in safety and comfort will far outweigh what you have spent. These boots have a rubber sole. Extra padding has been added to the insole and sides of the boots. The toe and heel have been reinforced. These boots run a half size bigger to allow room for socks. Some customer complaints that the seams could have better construction. Even though these run a half size bigger, some users find they are still too small. Having a tough time deciding whether you should choose rubber or felt soles? Then these wading boots have just the thing for you. You can be sure that these wading boots won't slow you down. Many people have a preference for what type of sole they use on their wading boots. Often times they will purchase two different boots, so they can have both felt and rubber soles. These wading boots have an interchangeable sole, allowing to quickly change form rubber to felt. Essentially giving you the best of both. Any good quality wading boot should have a system for draining the water from your boots. This will reduce the amount of extra weight your boots will carry. Not to mention the fact they will dry at a much faster rate than boots that don't properly drain. Taking a look at these boots, The value alone is worth the cost. You get a boot that allows you to use either rubber or felt soles. They will dry fast and won't weigh you down while traveling through the water. These boots have interchangeable soles. They have drainage for letting excess water out. Boots tend to dry faster than others. Customers complained that one size bigger is still too small. Some complaints of loosing a sole in the water. Often times while traveling through the water, we feel every piercing rock or log. That is not the case with this pair of boots, they are designed for your comfort. Walking in the water is sometimes a feat all it's own. Some of the logs and rocks can cause discomfort to your feet. That is not the case with this pair of boots. The soles are felt, but the surface the felt rests on has added thickness. The thicker sole will absorb some of the stress your feet will endure. Your boots should have a dependable lacing system, after all, the lacing plays an important role in your comfort. These boots have a dependable lacing system that includes rivets for durability. The cost for these is relatively average, as far as wading boots are concerned. You will find that they are above average with what they have to offer. Comfort can be your best friend on those long fishing trips. These boots are designed with a thicker sole. The upper portion of the boot is made from mesh and PVC. The actual sole is felt. Felt bottoms are illegal in some areas. Customers have complained that the rivets aren't as dependable as stated. You can feel free to wear these wading boots over the trails or in the water. They offer you plenty of support while wearing the boots. Added to the support is extra protection for the rough terrain you may need to navigate. Since these boots have a rubber sole, you can wear them both on land or in the water. They also have added material around the ankle, this adds more stability while traveling over logs or rocks. This stability helps to prevent sprains or twisting of your ankle. Tired of the pain from bumping against the debris under the water? Then these wading boots have just what you need. They have added material to the toe, which provides you with a buffer when you bump into the unknown. These wading boots can be your best friend when it comes to safety, and at an affordable price for the average consumer. If you have ever twisted your ankle under the water, you know the pain and frustration that it causes. These boots can help reduce the chances of injuring your ankle. Rubber sole is easy to clean. These boots provide a good grip. Added support for your ankle. The toe cap is reinforced. Customers state that the rubber sole peels away after minimal use. These boots are for those who are looking for a fit that falls between a hiking boot and street shoes. The felt on the bottom, keeps you on your feet over those slippery surfaces. Sometimes you just don't want to wear a boot that restricts your ankle, truly the fit is a preference. This lower profile boot is for those who want comfort while wearing their wading boots. These provide a wider range of motion, for tromping through the stream. Aside from the fit, these boots have a felt bottom, which provides you grip on those slippery surfaces. With a lacing system that is quick and easy to use, you can easily slide these boots bot on and off. Taking a look at the cost of these, they tend to fall in the middle of the pack. These wading boots offer the wearer a less restricted range of motion while walking through the water. With the added extra features, these wading boots can be of value to your feet. Bottoms are made from felt. These are a lower profile fit. The toe has rubber over it. Customers have stated that the laces seem cheap. 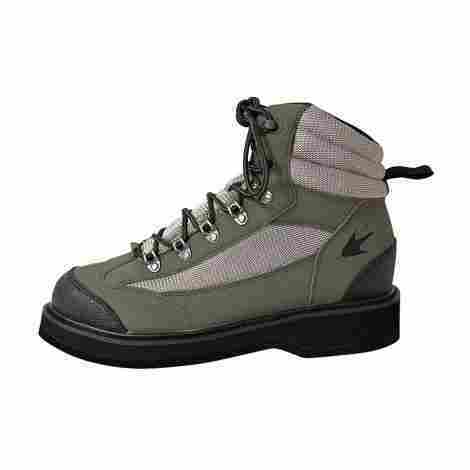 Next on the list is a pair of wading boots that have it a couple of firsts on our list. They are our first look at a different type of material used to construct the upper. As well as the first pair we have come across that has stepped up the felt bottom game. This is our first look at a leather upper, but don't you worry these are highly durable. The leather is a tough material, so it only makes sense that it will last longer when getting knocked around under the water. The unique drainage system will allow water to flow through the boots, never weighing you down. As we have gone over before, felt bottom boots can provide a superb grip on those slippery surfaces. But when you add studs to the mix, you get a grip that can't be beaten. You can be sure that you will be prepared no matter what the surface you are facing looks like. Made from leather, these boots are very durable, allowing you to use them time and time again. Pair the felt bottoms, with the stud, and you will know that you have the best grip possible. At not much cost to you, you will get a pair of boots that have the potential to last for several fishing seasons. The upper portion of the boot is made from leather. These boots have a drainage system. Boots have a felt bottom. Bottoms have the ability to be studded. Customers have stated that when the leather is dry it does have some shrinking. A boot that allows you to walk over even the slipperiest surfaces while fishing in the river. You won't waste any time placing these on or off of your feet. The quick change allows you to spend more time doing what you love. The lacing system design will allow you to quickly place these boots on your feet before heading into the river. Once you're finished with them, you can quickly remove them as well, so that you can be on your way. Being that these are felt on the bottom, you know that your grip will be strong. 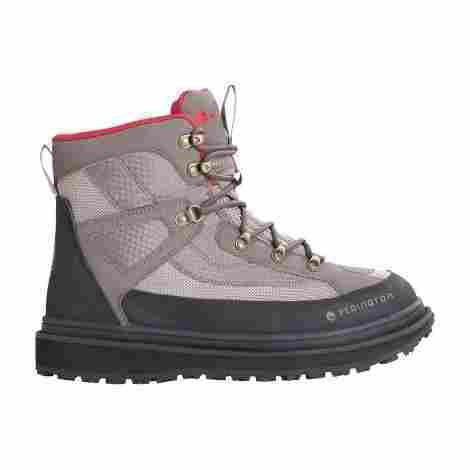 Tried and true a felt bottom wading boot can keep you on your feet while stepping onto those mossy rocks or logs. Falling in line with the pack for cost, these boots won't be a waste of your time. With a quick lace design, you can have these boots on and off in no time flat. The bottom of the boots are felt. These boots are wide to allow room for wading socks. Lacing system was designed for speed. These boots are light in weight. Some complaints that the soles don't hold up for long. Some have seen rusting on the lace loops. These wading boots give you the opportunity to choose between the sole type. 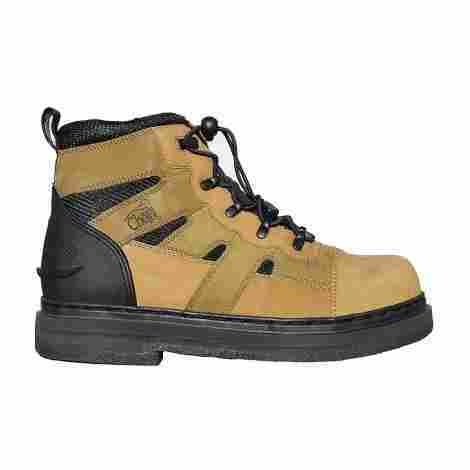 The construction of the upper portion of the boot offers you a durable pair of wading boots. 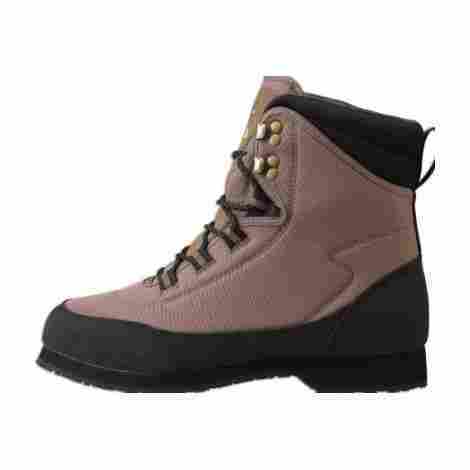 These wading boots can be purchased as either felt bottom or with rubber soles. This allows you to choose the bottom you prefer, as everyone has their own opinion about which is best. 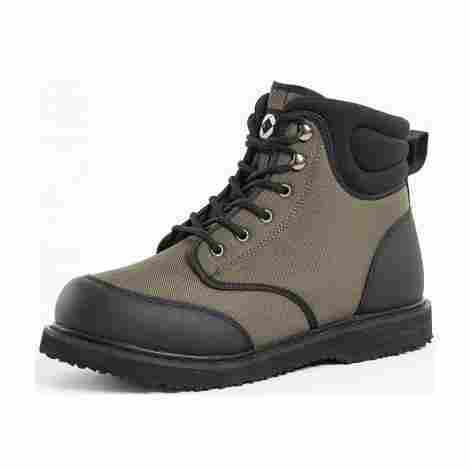 The upper portion of these boots is made from a combination of leather and nylon. These materials provide the boots with a good amount of durability. To add to the durability, a rubber cap has been added to the toe. So those times that you stumble into a rock or log, your toes won't suffer for it. The cost of these boots will depend on the type of bottom that you choose. The rubber-soled boots will add a little to the cost. The durability of the boots is beneficial to your feet and your pocketbook at the same time. These boots come in both rubber and felt soles. The upper portion of the boot is made from leather and nylon. Boots have a reinforced toe. Some have complained that the boots don't have good drainage. Here we come to another great rubber sole option that has added potential. The boot fit overall provides your feet with comfort. While the materials used offer dependability. These are a rubber sole, which makes them great for traveling over land or underwater. They also can have studs added to them, which provides better grip on those surfaces that pose a challenge. These are also available as a felt option. You want a pair of wading boots that will allow the water to drain, to lessen the load. But having proper drainage also means that they will dry rather quickly as well. With added rubber to the toe, you can be sure that those bumps and scrapes won't ruin your boots. 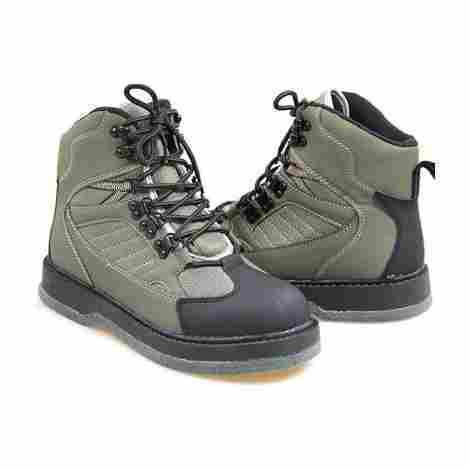 These wading boots are constructed from high-quality materials, which gives then a higher cost than some of the other options on the list. I guess you have to weigh the odds, do you want quality or lower cost? These are made with rubber soles. Soles can have studs added to them. Rubber toe cap in place for durability. Also available with felt bottom. The last pair of wading boots we come to on the list isn't last because it holds no potential. These boots offer an amazing amount of grip and stability while using them in the water. The bottoms of the boot are made from felt, so you know that the grip will be amazing. Allowing you to pass over those slippery rocks and logs with ease. Reducing the chances for a slip or fall accident. Since these sit a little higher on the ankle, you can be sure that your ankle will be a little more stable. As we all know, traveling through the water can be a difficult task. Having ankle support gives you one less thing to worry about. 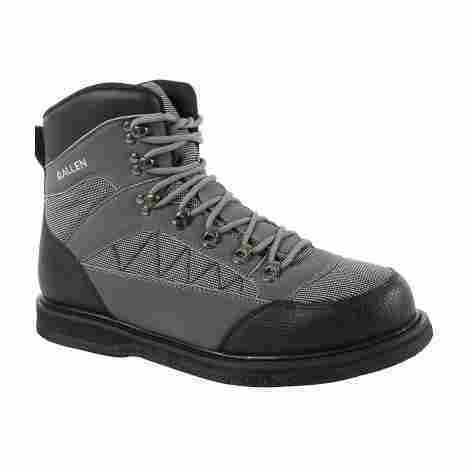 These are an affordable pair of wading boots, great for those trying out wading boots for the first time. These boots will allow you to test the waters so to speak, before plunging into a more expensive pair of boots. These boots have a felt bottom. The boots offer ankle support. The upper portion of the boot is breatheable. Product needs to be ordered one size size larger. Now that you have had the chance to go over the information we have provided, the next portion of the guide will walk you through the information we used to create our list. We include this in our guide so that you have a better understanding of what the product has to offer. When you see a feature that catches your eye, this is the section that will give you further insight into that feature as well. We will end this guide with a question and answer section about wading boots. These questions are ones we found to be asked more commonly, it is our hope that this will ease your mind before deciding which boots will best suit your needs. You might be wondering why on earth you would need wading boots. One of the top reasons to wear wading boots is your safety. There are numerous reports of accidents, due to slipping in the water, that occur while fishing in streams and rivers. These cause of these accidents is typically the type of footwear the angler has on. Wading boots can reduce your chance of slipping when the right type of sole is worn. A good wading boot will not only provide better grip on slick services, they will also provide support to your ankle. A thought to take away, an angler who chooses to use wading boots, will have a safer, more enjoyable fishing experience. Rubber: Rubber soles can be found with a couple of different pattern options. They are available in a more traditional wader pattern or can be found to resemble the tread of a hiking boot. Which one is best for you will depend on the terrain you plan to travel over. For instance, an angler who prefers to travel light, over a rough terrain to get to their fishing hole. A hiking tread would be highly beneficial to that angler. As this type of tread can be worn on land or in the water. Rubber soles are known for their durability, traction, and the fact that they are easy to clean. Felt: Still leading the pack for traction, is the felt soled boots. These are designed for use even on the slipperiest of surfaces. However, they are not made for hiking over rough terrain. As the years have passed, states have outlawed the use of felt-bottomed wading boots. The reason for this, it has been found that different invasive species are being transferred from one body of water to another. Believe it or not, the invasive species are surviving in the moisture that the felt holds in. As we all know this can be detrimental to the natural habitat of the fish, therefore it is best to check the regulations in your area, before purchasing wading boots with a felt bottom. Studded Soles: A studded sole is made from rubber, but will allow you to add studs to the soles of the boots. They are relatively easy to place and remove. Most anglers will purchase these when they know they will be in conditions that they will need a little extra traction. A prime example of this, a faster running river or stream, the studs can help ground you. This will give you a better sense of balance while navigating the debris at the bottom of the water. First-time users of wading boots may not know what to expect from their wading boots. Here is the lowdown, wading boots are not made to be waterproof. Instead, they are made to allow water in, which provides you with a little weight for added balance. They will also need to let the water out at a rapid pace, as to not weigh you down too much. Wading boots that do not achieve this, will leave you feeling exhausted at the end of your fishing trip. The upper portion of your wading boots holds an equal amount of importance. They should be made from materials that will allow water through the boot, but not holding the water within the material. 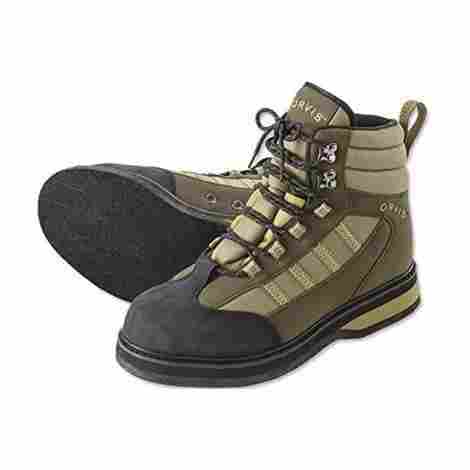 Most boot uppers can be found made from either polyester or nylon. There are some that can be found made from a synthetic form of leather as well. These materials are lighter in weight, which only adds to your level of comfort. Breathable materials are also important, just because your feet are submerged, doesn’t mean they won’t sweat. An example of a better constructed upper would be one made from a combination of synthetic leather and nylon. These materials when combined will allow water to flow, without adding too much weight to the boot. It should not come as a surprise that ankle and foot support is an important aspect for choosing a pair of wading boots. Walking over large, unstable rocks can pose a huge challenge for anglers. Often times this is where accidents happen, an angler will attempt to move from rock to rock. In a split second those rocks can shift, causing your ankle to buckle. Many manufacturers have come up with features to combat that issue. You will find boots that offer extra padding to the ankle and stiffen the area around the heel. This will limit the amount of movement your ankle can make, in the event that you slip. As for your feet, finding boots that have a good lacing system is crucial. When your boots are laced properly, you reduce the risk that your boots will allow your foot to slide around. A pair of boots with a wider tongue area, provide added protection against debris entering your boots. There is no worse feeling for discomfort than a tiny pebble entering your boot. It is also best to look for a pair of boots that offers added toe and heel protection. This protection is normally found in the form of an extra piece of rubber over both of these areas. That rubber is your best line of defense against rubbing and bumping into debris. Selecting the right size wading boot is another crucial decision to your feet. Some brands will accommodate their sizing for the use of wading socks, while other brands do not. A good rule of thumb for choosing the correct size is to go with a size up from your normal boot size. This will allow you the proper amount of room within the boot for a comfortable fit. 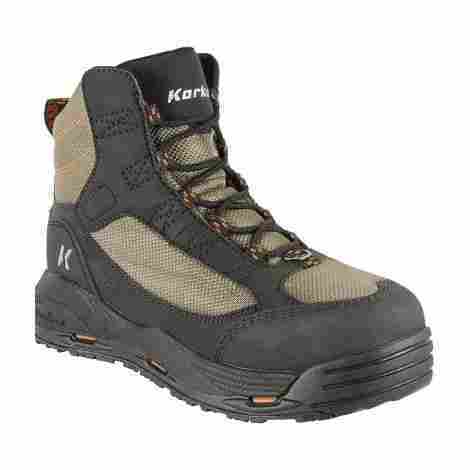 You want to have a little wiggle room in the toe area, as wading boots do tend to suffer from some shrinking. When your boots are too tight, this can cause problems with circulation in your feet. Most manufacturers will have a size chart you can use to compare for which size you need. When ordering online, many will have a warning about their sizes, letting you know whether or not they run bigger. Often times when the wrong size is ordered you can return the product for the correct size. It is highly recommended that you do this, don’t just settle for the size you have. Doing so can be detrimental to your feet, as well as causing a possible accident. We have already touched on the invasive species aspect, in order to do your part in preventing them from spreading, you will need to clean your wading boots. This should be done on a regular basis, after each fishing adventure. You can wash off as much of the mud as possible with a hose. In some instances, it has been noted that people will use their pressure washer to remove tough mud. For those who don’t have a pressure washer, a good stiff bristled brush and some elbow grease will do the trick. It is best to allow the boots to dry completely before storing them. When cleaned and cared for routinely, you will get a longer life out of the boots. Q: How do you dry wadding boots? Start by tying your boots together using the laces. Open the door to your dryer, set the laces over the door, with the boots on the inside of the door. When you close the door, the boots will be hanging on the inside, never touching the drum of the dryer. Run your dryer for a standard cycle, when it is finished, your boots should be dry. Q: Which sole material is the most durable for wading boots? A: The most durable sole material for wading boots is going to be the boots that have rubber soles. These boots can be found to mimic hiking boots, which allows you to wear them over the rough terrain you travel to arrive at your fishing destination. Q: What type of sole offers the best traction? A: Among anglers, this answer is a rather large debate, causing many arguments. Some will tell you that a rubber sole will offer the best traction. You can get rubber soles that look like a typical water boot or choose one that resembles that of a hiking boot. For added traction, there are even rubber soles that studs can be added. 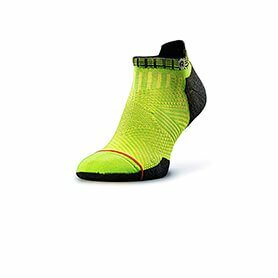 On the other hand, you are sure to find opinions that sway toward felt boots being the best for traction. Many anglers are creatures of habit, therefore they will stick with an original item. You will need to keep in mind, that some states have banned felt bottomed boots. Due to their ability to host invasive species. When choosing a sole consider your method of travel, as felt boots are meant solely for the water. Q: Are wading boots waterproof? A: On the contrary to popular belief, wading boots are not meant to be waterproof. They are the exact opposite, wading boots allow water into the boots. Which adds weight to keep your balance more stable. But when the water goes in, it must also come out at a rapid pace. This will ensure that your wading boots don’t weigh you down too much. One can think of wading boots having to create a delicate balance to accommodate your fishing needs. Q: How do I know what size boot I will need? A: In most cases, the manufacturer will have a size chart for referencing the size you need. In the event that they do not, it is best to choose a size that is one full size more than your regular boot size. This will allow room for using wading socks with your boots as well. When planning to use the boots in cooler water, adding an extra size and a half are recommended to accommodate for thicker socks to be worn. Q: If my wading boots are too small will that be a problem? A: Yes, wading boots that are too small can cause a couple of issues. First, since your feet are not comfortable, your footing won’t be as secure when you step. This can cause you to become unbalanced, which can lead to falling into the water. Next, wading boots can sometimes see some shrinkage, this can cause an already ill-fitting pair of boots to become worse. Small boots can restrict the flow of blood in your feet, causing numbness or tingling. When used in cold water, small fitting boots can cause your feet to freeze much quicker. It is best to shoot for purchasing a pair of boots that fit properly.